So what's the big news in Midwest distance running right now, apart from the beginning of college X-country season which is just on the horizon? One of the biggest road races in the Midwest is the Health Plus CRIM Festival of Races in Flint, Michigan. For information on the inaugural USATF-Indiana 5K Championship,also on Saturday, August 23rd, please see below or visit: http://www.born2run5k.org/Born2Run5K/Born2Run5K.html. and Herb Lindsay, who qualified for the 1980 10,000 meter Olympic trials in 1980, was another important early winner. On the women's side, Joan Benoit Samuelson, the winner of the 1984 Olympic marathon, took the women's title. More recently they have had outstanding runners such as Molly Huddle win their race. Molly Huddle, on the left, battling Shalane Flanagan for the lead in the 2013 US National Road Racing Championship. This year the Michigan Mile will not only have some top open elite competitors but will also be the USATF Masters 1 Mile Road Championship. Top masters runners (40 years of age and over) will compete for an overall masters title as well as age group medals and prizes. For the open professional athletes it is the 5th of 6 races in the Bring Back the Mile Tour. Current leaders include Olympic silver medalist Leo Manzano on the men's side and Gabriele Grunwald, a competitor in the Indoor World Track and Field championships earlier this year. A sub-4 minute mile is possible on the men's side. 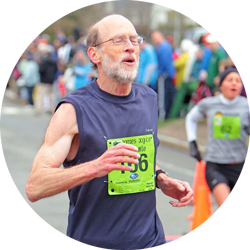 The Masters athletes will not run that fast but the 40-44 year olds should come in well under 4:30 and some veteran runners like 65 year old Sabra Harvey on the women's side will likely finish well under 6:00 as will 73 year old Doug Goodhue who will try to stay under 5:45. Cindy Harris, Jame Harris and yours truly, are entered. Come join us! Check in next week for the first installment on the upcoming college X-country season, with special emphasis on teams in Indiana.